The map probably won't be anything special, (probably just a slightly edited version of the real world map...) but don't worry I'll make sure to include all of the countries that we know of so far, and Asaca will have its own map. The unis are field hockey style dresses, but my line of thinking was more down the route of netball (which is fairly popular here in Australia). 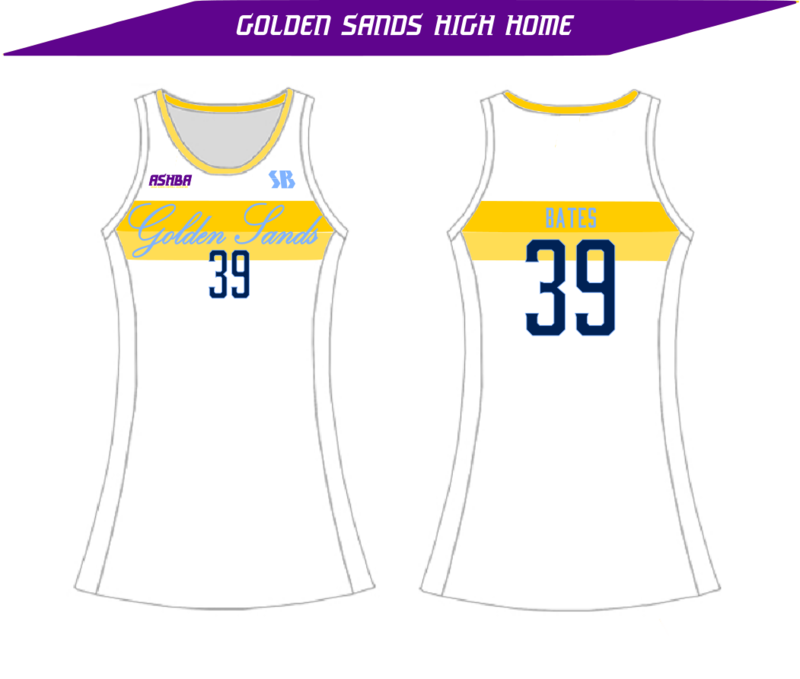 I'd say if you looked up netball you'd get a good idea of the uni's in action. 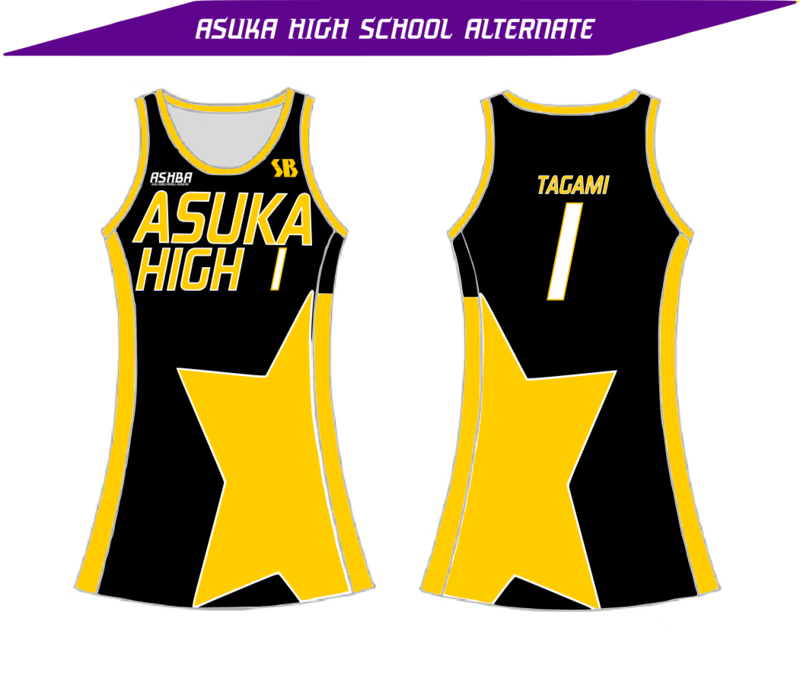 In a somewhat related side note with a bit more background on Asaca, HoopBall uniforms are worn in a similar way to that of say basketball jerseys as casual clothing. 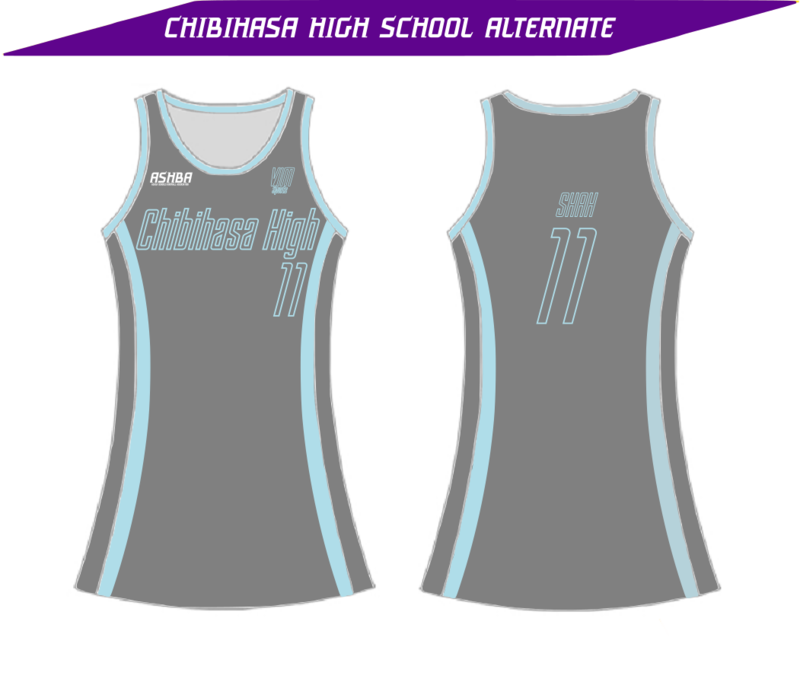 There are also basketball style jerseys for male fans (a sport as popular as the AHBA, would undoubtedly have fans of all genders), but many just buy the dresses and tuck them in as it's not seen as unusual. Heck, I would have some if there was a way to get them lol. I'm glad I have at least one person as interested as you are! Speaking of maps; here is a rough map of Asaca. This map will get updated as the seasons progress and as we learn more about Asaca. The three new locations, Haurn Island, Osyth and Kinori Bay all have relevance to the AHBA in some form, whether in the future or currently. 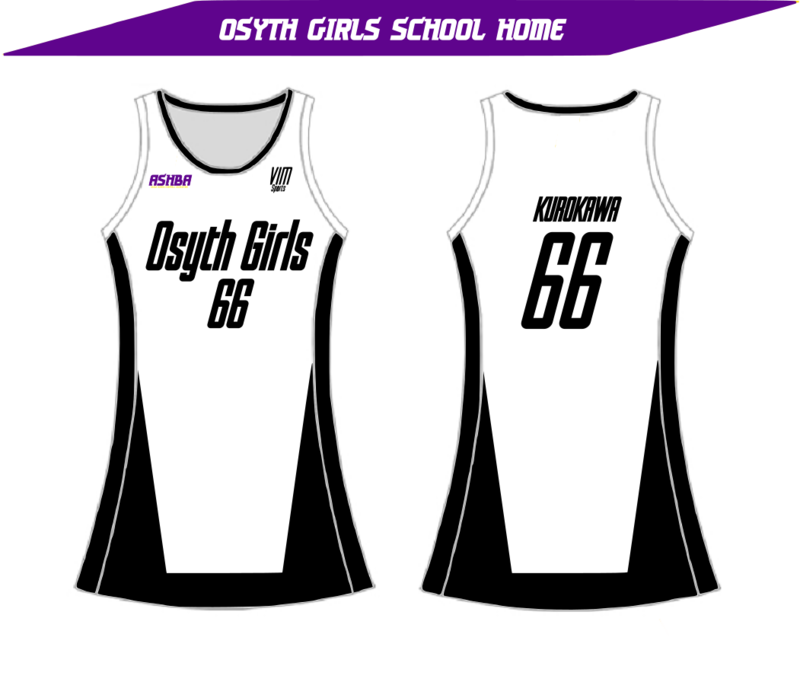 Osyth is where one of the ASHBA schools (Osyth Girls) is situated, and is known as a very dark and dirty place, due to the town's involvement in industrial production in Asaca. Many stories of murder and crime often emerge from Osyth, furthering its bad reputation. Kinori Bay is a popular beachside holiday destination, which boasts the warmest weather anywhere in Asaca. Many wealthy people have houses in Kinori Bay which are seemingly rarely used, with only a large amount of exotic cars often seen driving around to suggest otherwise. Haurn Island is a small island situated north of Jarran. Famous in Asaca for its strange location and many abandoned houses, Haurn Island is often quiet and not much seems to ever happen there. That's all for tonight, but here may be a chance that the last four teams' new looks are unveiled tomorrow night. "Today, the remaining 4 teams unveiled their looks for the 2012 season. The Asuka Magic, Chibihasa Lighning, Turrif Raiders and Hikaru Heat all unveiled logos and uniforms, which along with official press releases from SB, can be found below." - Official AHBA website, ahba.com.ac, 23rd February 2012. SB worked with the Magic to create a more memorable brand for the team, after their inaugural set didn't resonate well with their fans. 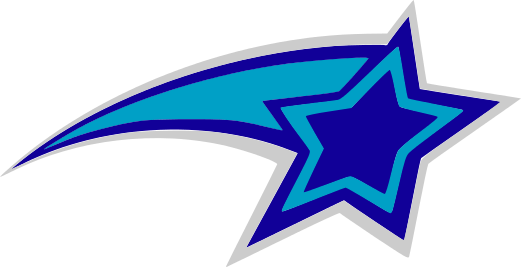 The streaking star from the logo is used as the main feature of the uniforms, in various colour combinations depending on the uniform. 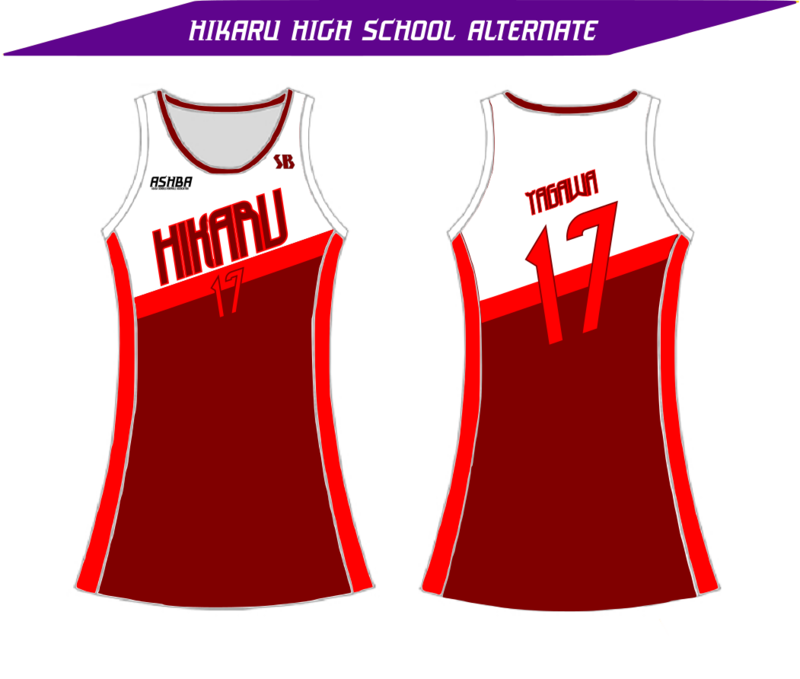 The home uniform (as to be worn by D1 Sumi Nagai (#0)) is a direct translation colour wise of the main logo in the upper portion of the design. 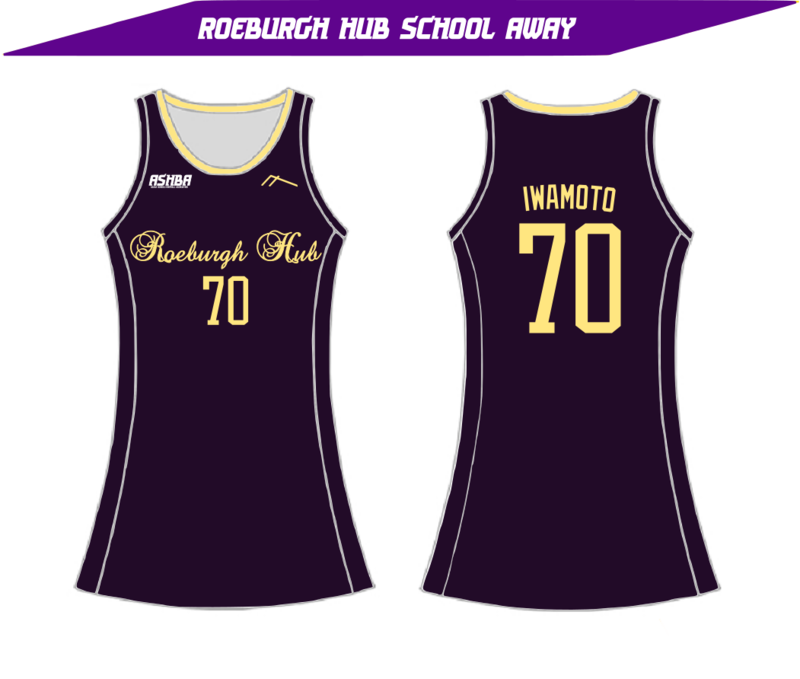 The away (as to be worn by team captain D4 Nana Tomita (#40)) is a colour flip of the logos' colouring in the upper portion,with Smoke Grey in the lower portion of the design to differentiate it from the home uniform better. 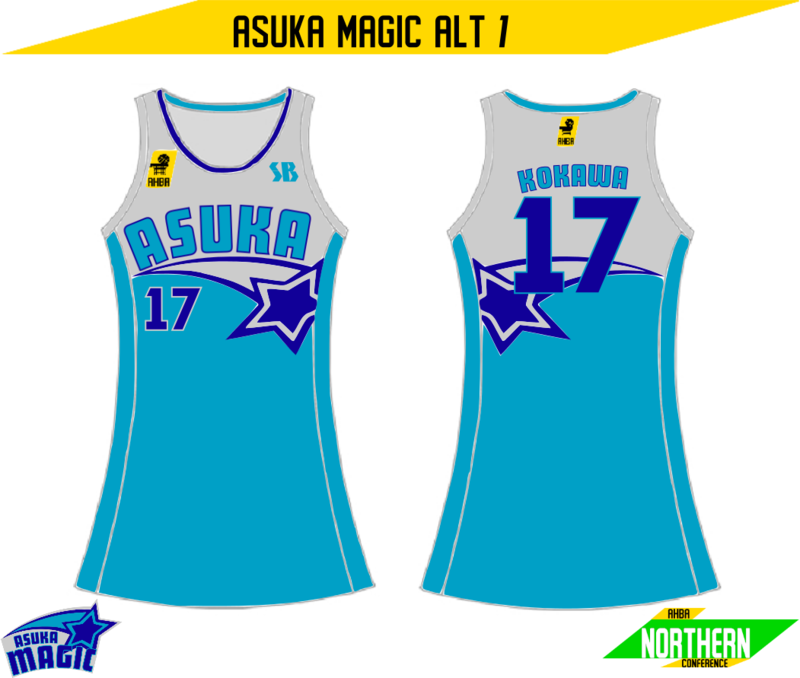 The first alternate (as to be worn by O3 Mina Kokawa (#17)) features a Smoke Grey and Dark Magic Blue streaking star along with ASUKA (MAGIC on all other uniforms) in the upper portion and Light Magic Blue as the colour in the lower portion of the design. 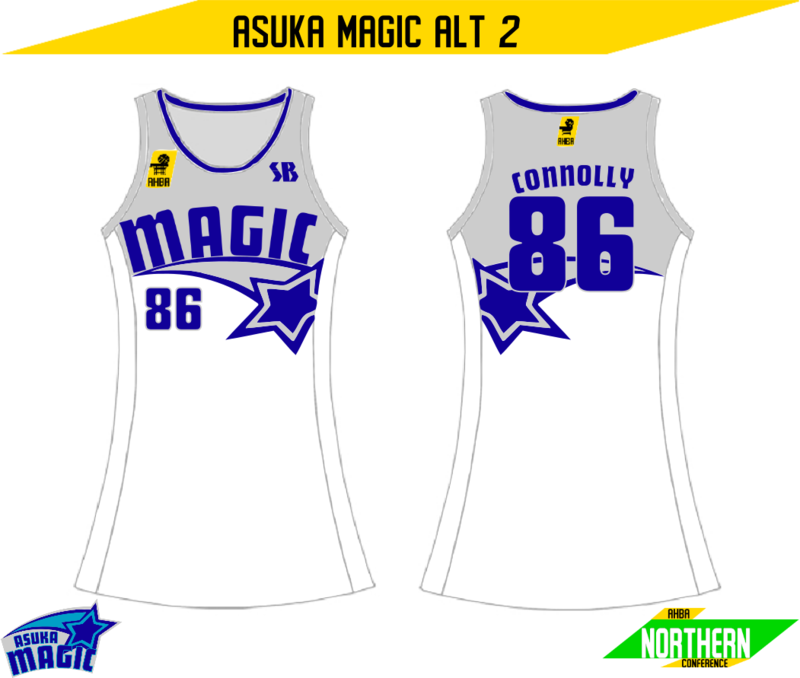 The second alternate (as to be worn by O2 Sienna Connolly (#86)) is intended to only be worn at home, and features a similar design to the first alternate colour wise, only using Dark Magic Blue and Smoke Grey for a more monochrome look. 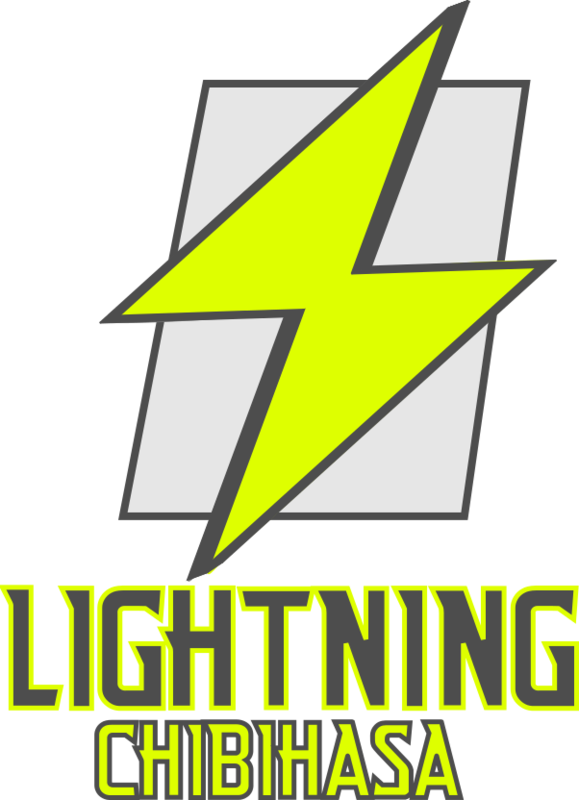 SB worked with the Lightning to create clean uniforms that could be worn for several seasons with only minor tweaks, but maintain the excitement of the team's bright and bold colours. An extended version of the lightning bolt was used as a main design point in a contrasting colour to separate the top and bottom portion of the uniform's design. 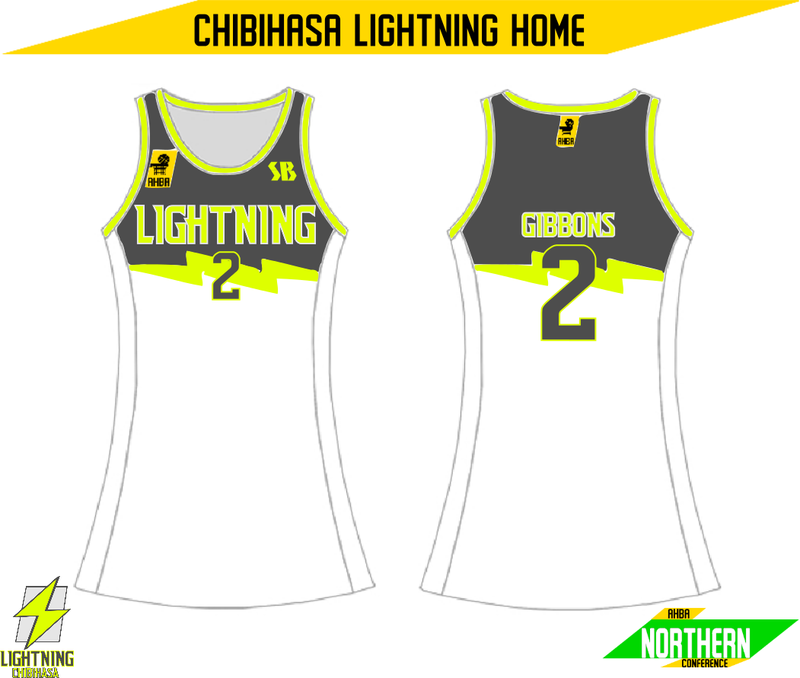 The home jersey (as to be worn by 2011 MVP and team captain O2 Suzuka Gibbons (#2)) features this bolt in Bolt Yellow with a Slate Grey section above to contrast with and bring out the Bolt Yellow wordmark. 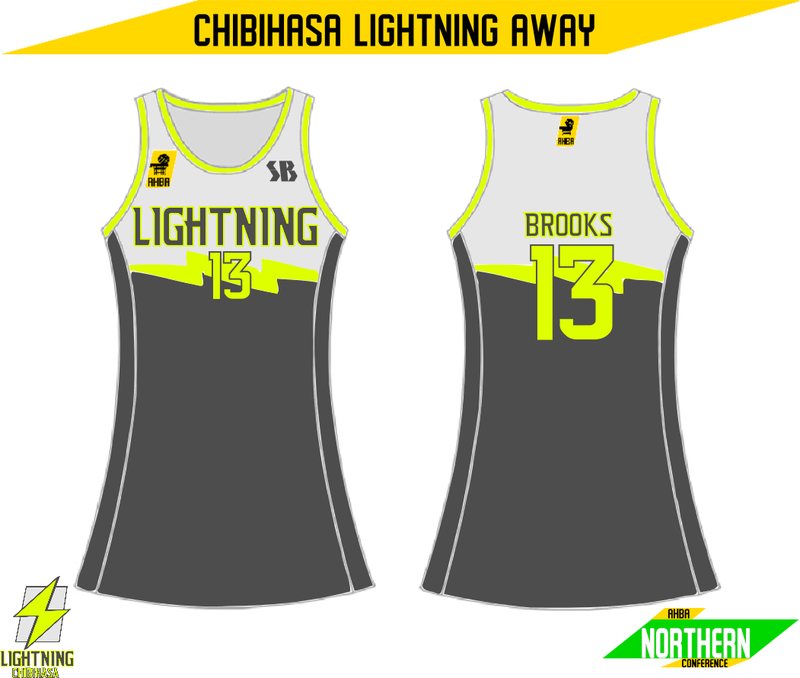 The away jersey (as to be worn by D3 Uiko Brooks (#13)) also features a Bolt Yellow bolt, with Stone Grey above and Slate Grey below. 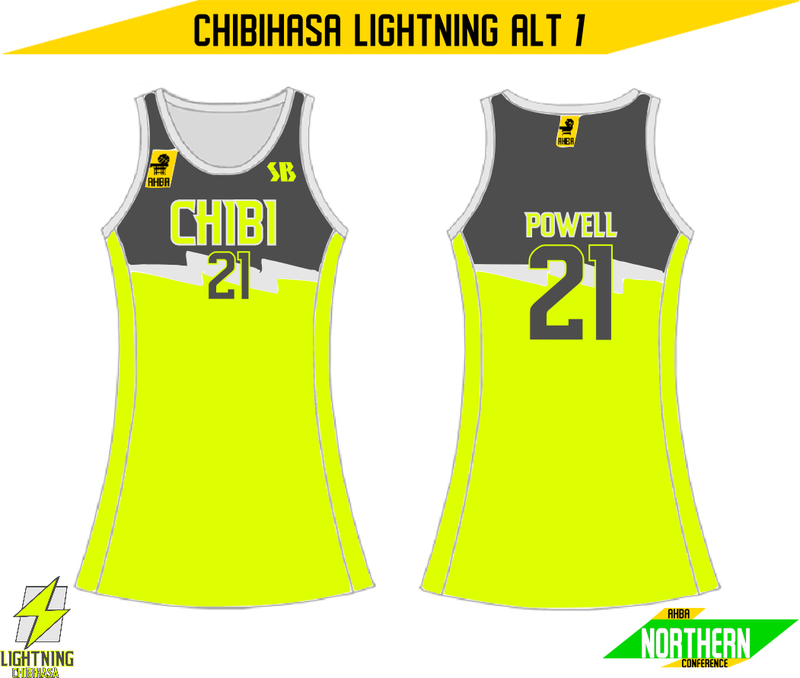 SB continued the Lighting's tradition of having the city's nickname on a Electric Yellow uniform (as to be worn by O2 Molly Powell (#22) with Rookie O1 Elizabeth Onodera's number (#21) (never realised that until now, but I can't be bothered fixing it.). 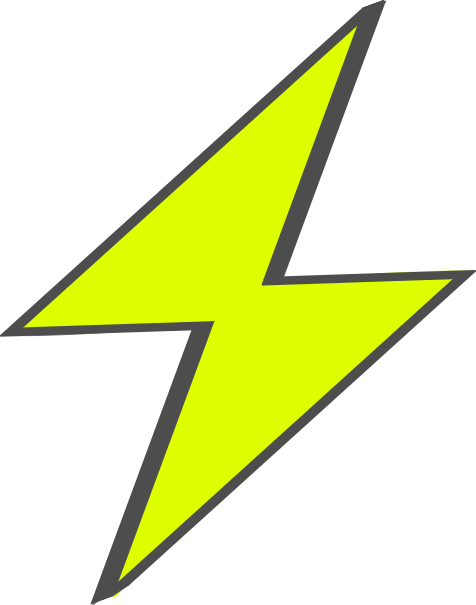 Slate Grey is above and Electric Yellow is below a Stone Grey bolt for this uniform, with an Electric Yellow CHIBI wordmark. 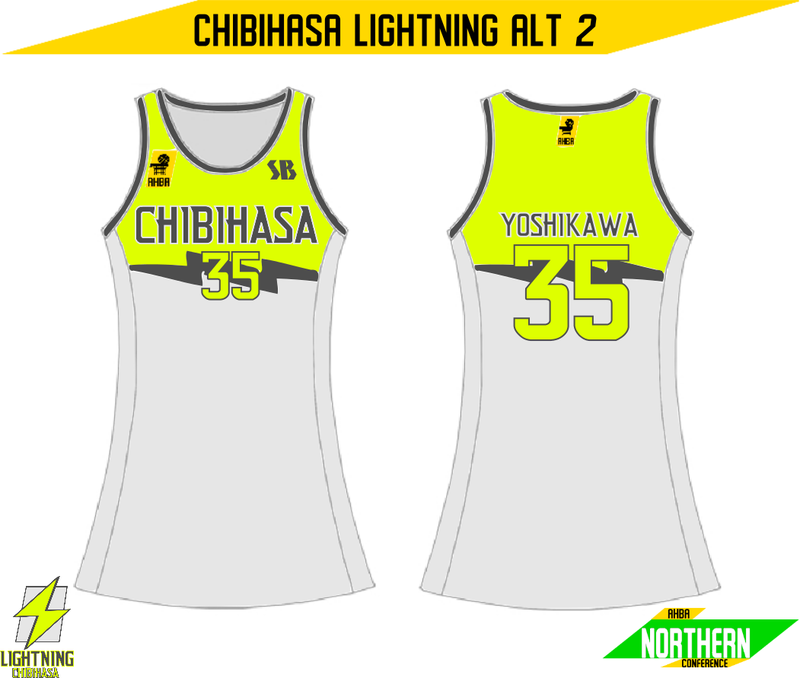 The second alternate (as was to be worn by recent expansion draft pick D5 Katie Yoshikawa) is a different take on an Electric Yellow alternate, with Electric Yellow above and Stone Grey below a Slate Grey bolt. This uniform also features the full city name in Slate Grey. SB worked with the Raiders on a uniform set that would evoke memories of their inaugural set, with out the sword imagery on the uniform itself. 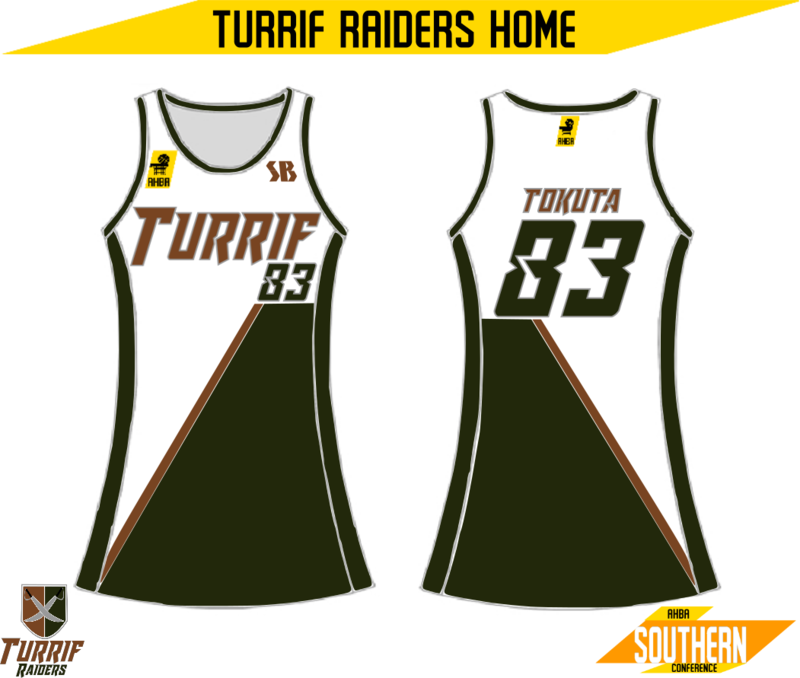 The home uniform (as to be worn by team captain D2 Samatha Tokuta (#83)) features a similar colour layout to the team's new main logo, with an Oak TURRIF wordmark and Leaf Green numbers. The diagonal design is reminiscent of the diagonal sword from the team's inaugural set. The away (as to be worn by O4 Bethany Wilson (#5)) is primarily Oak, with a Leaf Green RAIDERS wordmark and Steel Grey numbers. The diagonal design is also Leaf Green and Steel Grey. 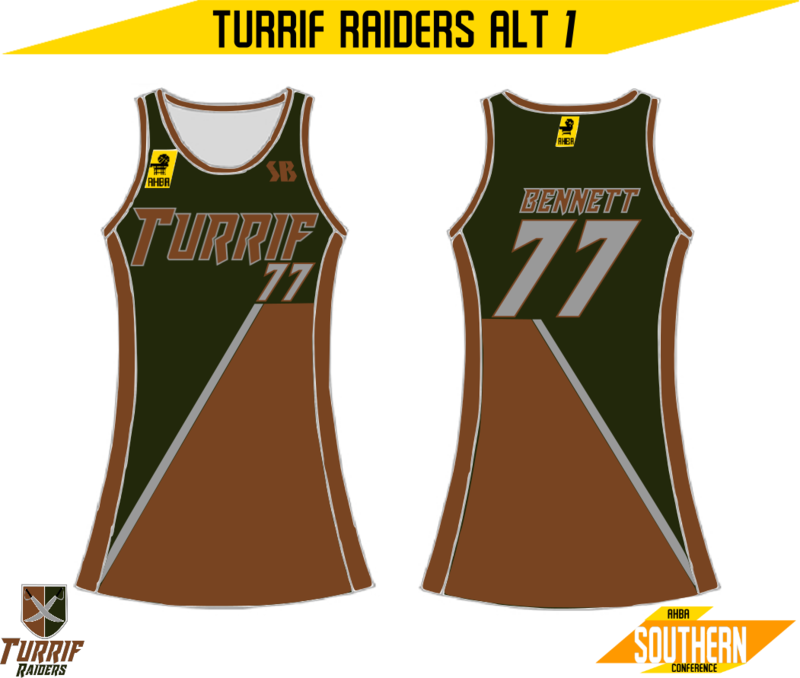 The alternate (as to be worn by 2010 Finals MVP Summer Bennett (#77)) swaps the roles of Oak and Leaf Green for a different take on the away's template. When SB was asked to "slightly update" the Heat's uniforms in line with their new colours of Flame Orange, Heat Orange and Flame Yellow, we looked to keep a large amount of the design from the Heat's inaugural set. 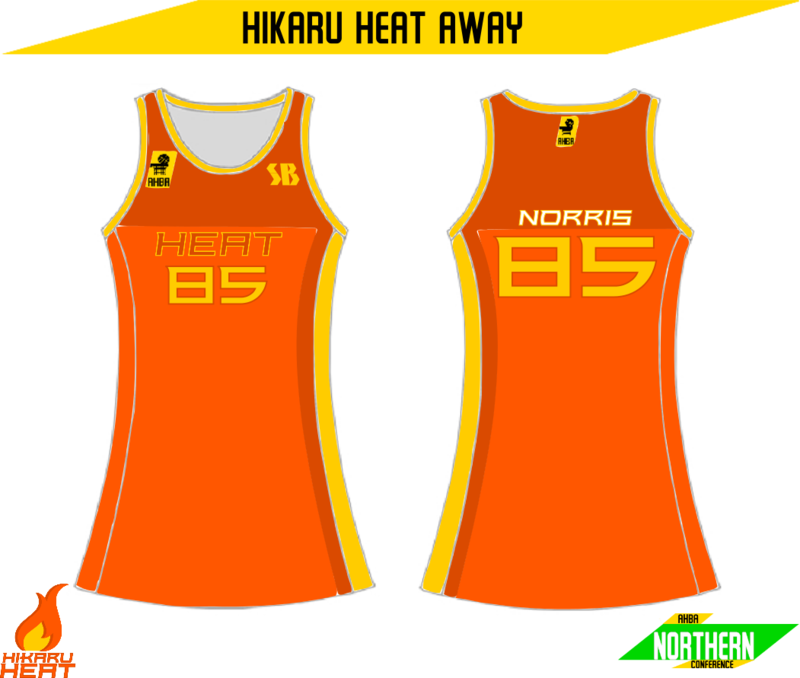 Changes include an asymmetrical striping pattern/design to highlight the Heat's double orange colour scheme, and a font similar to that used for the Eslian National Team's 2012 IHBF set. The two oranges are side by side on each uniform, with the home (as to be worn by vocal captain D5 Abby Mitchell (#59)) and Flame Yellow alternate (Alternate 2, as to be worn by O3 Sanakao Shinohara (#55)) sharing one version of the double orange (Flame as the main stripe/design color and Heat as the secondary stripe colour). 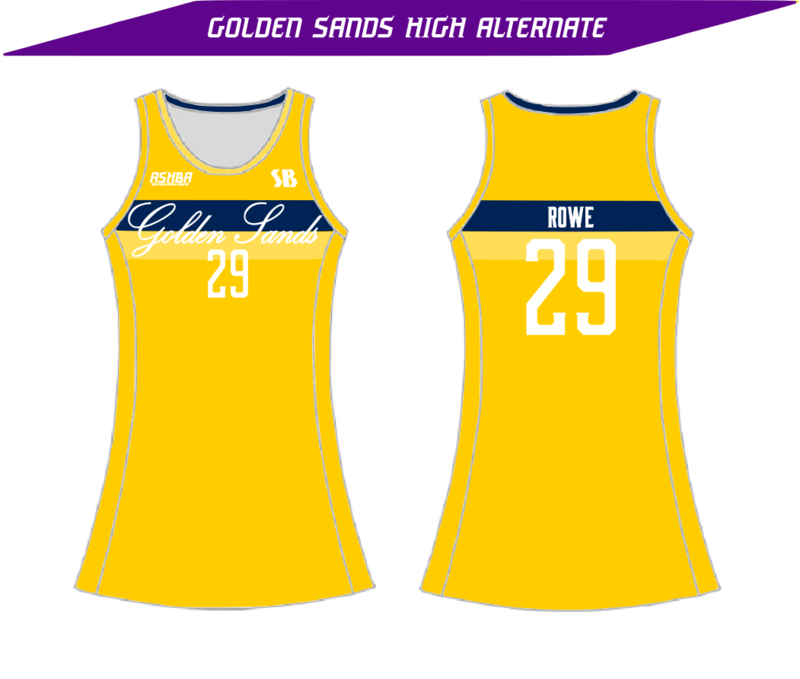 The other version is shared by the Away (as to be worn by D3 Chloe Norris (#85)) and Alternate 1 (as to be worn by 2011 Rookie of the Year O2 Gracie Bird (#69)) with Flame (for the away) or Heat (for the alt) as the main colour of the uniform and the other as the main stripe/design colour. Both these two jerseys use Flame Yellow as the secondary stripe colour. That's all for the offseason, with the 2012 Season beginning March 1, 2012. Results for Weeks 1 - 10 (and rosters) will be next up, and possibly some ASHBA (Asacan Schools HoopBall Association) uniform concepts! Comments and Criticisms are always appreciated, and how do you think your favourite team will do this season? Wow! Some great updates there. Really like what you did with the Magic. These are some pretty great updates! Especially Turrif and Asuka. I'm not sold on Hikaru's double orange, but that's more of a personal preference than a design critique. I really wanted to improve on Askua's look, considering that I thought along with Chibihasa they had the worst uniforms and logos. Magic is an odd thing to try represent in a logo, so I took a more modern Orlando Magic style approach. This new look should stick around for a while, with maybe a few different Alt 2's. I did feel that most of the teams (particularly the ones unveiled very early on) really needed to be cleaned up, and Turrif and Asuka turned out really nice. I did redo Asuka twice after I felt the first redo wasn't as clean as it could be. As for Hikaru's double orange, I'm no longer completely sold on it either. It looks strange on the Away and Alt 1. I'm starting to think I should have left Heat Orange as an accent colour on the logo and gone with just Flame Orange and Yellow for the uniforms. I did however want to take red out, so I thought the second orange would work. 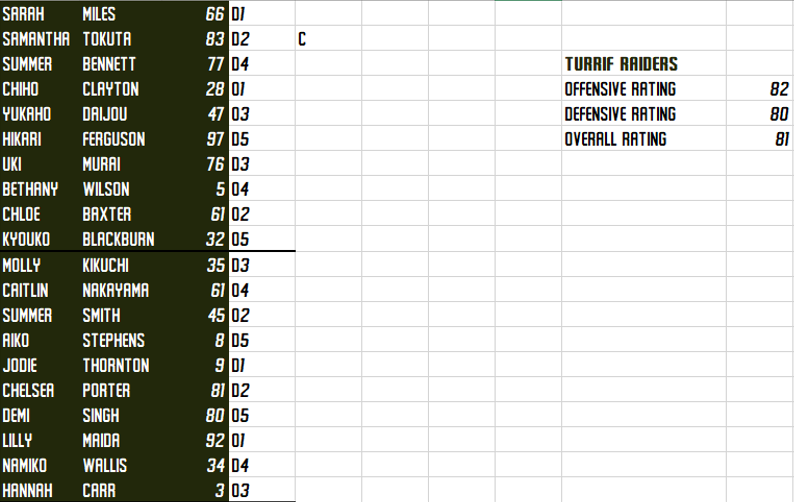 Thanks for the comments, I will endevour to have Weeks 1 - 10 up along with this seasons rosters by next week. I thought I'd make some signatures, one for each team for anyone who's interested. There's also a AHBA one with all the teams on it, like in my signature should you want it. Those sigs are pretty good, particularly the Lions (because go Lions) and the Raiders. I don't know if you do, but I really like how that update turned out. What do you play 2k on? Thanks! If you're talking about the Raiders update, then yeah, it's one of my favourites, mostly due to the font. I play on XBOX One, but region locking is a thing, so I doubt I'd be able to play with anyone on CCSLC. 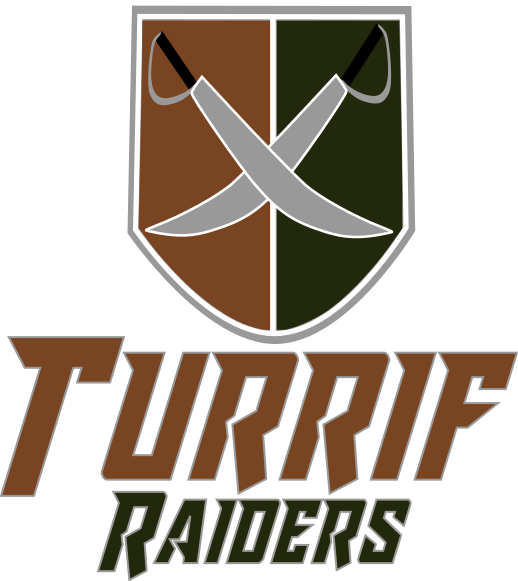 What font is that for Turrif, btw? "It is with great pleasure that Freya and I can announce that the AHBA 2012 season has now officially begun. Tonight marks the first game, with the Rondelle Queens up against the Honnaro Flight here at Air Asaca, which Freya and I will be courtside for. 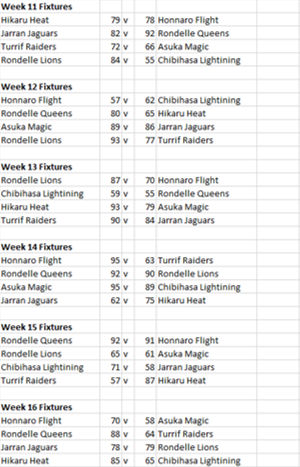 Friday brings game two, with the 2011 AHBA Champions, the Rondelle Lions facing off against the Asuka Magic, also here at Air Asaca Arena." 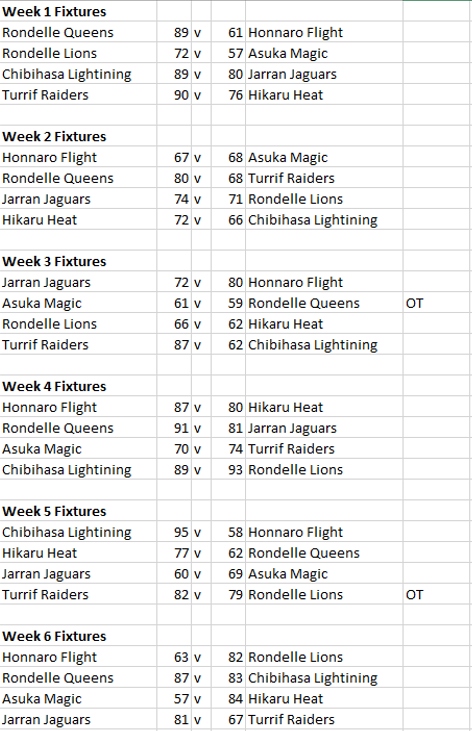 "Saturday will see the Chibihasa Lightning take on the Jarran Jaguars at the Chiba Energy Center. 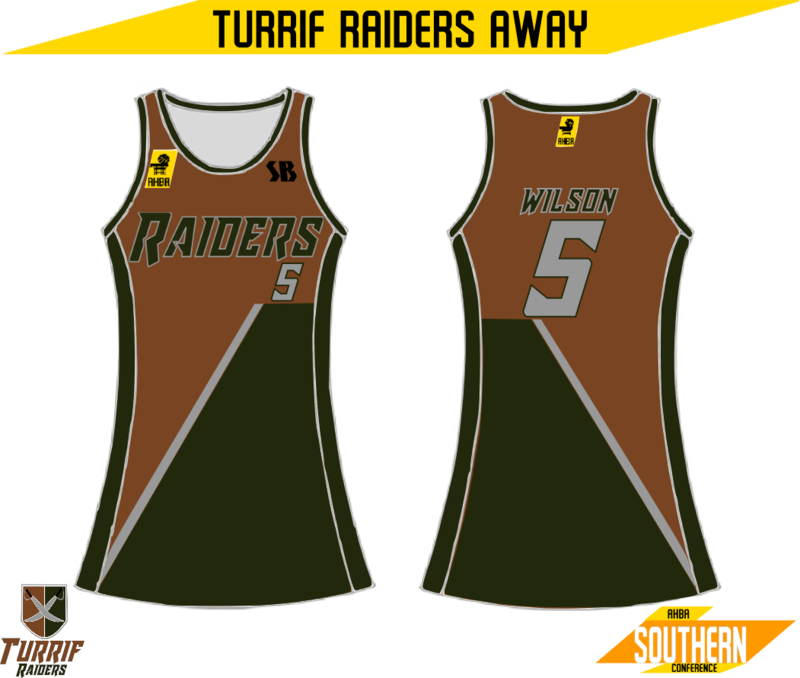 Sunday will feature the Turrif Raiders taking on the Back to Back Northern Conference Champions, the Hikaru Heat at CCargo Arena. Karen and I are looking forward to tonight's game and to find out what the rest of the season season will bring." It seems that the 2012 Expansion Draft has not been kind to the up and coming Lightning, who shockingly are sitting 8th, with a record of 3 - 7 through the first 10 games. After last year's surge to 4th something seems not quite right in Chibihasa, something which O2 Suzuka Gibbons dismissed as "early season jitters". 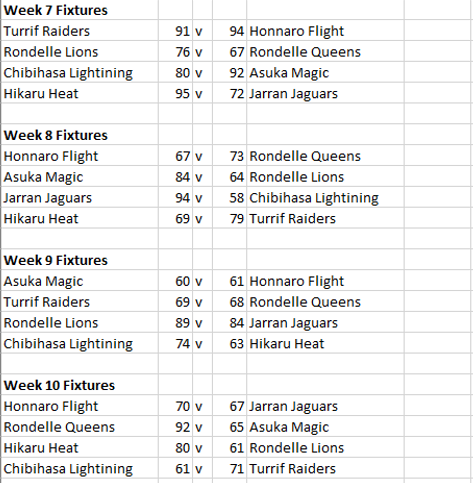 A nine point win against newcomers Jarran in Week 1, a large victory against the Honnaro Flight in Week 5 fuelled largely by Suzuka Gibbon's AHBA record 40 points and a gritty 11 point win against the two time Northern Conference Champions, the Hikaru Heat, in Week 9 have been Chibihasa's bright spots in what has been a largely disappointing first ten weeks for Chibihasa. Coach Kazu Marshall said that she wasn't concerned about her team's rough start, and that she knew what she needed to do to get her team back on their feet. This rough start has reminded some of Chibihasa's horrible 2010 season, but fans are hoping things will turn around fast. The lack of wins away from home (0 - 5 away, 3 - 3 at home) is also concerning, something the Lightning will need to change in the coming weeks. 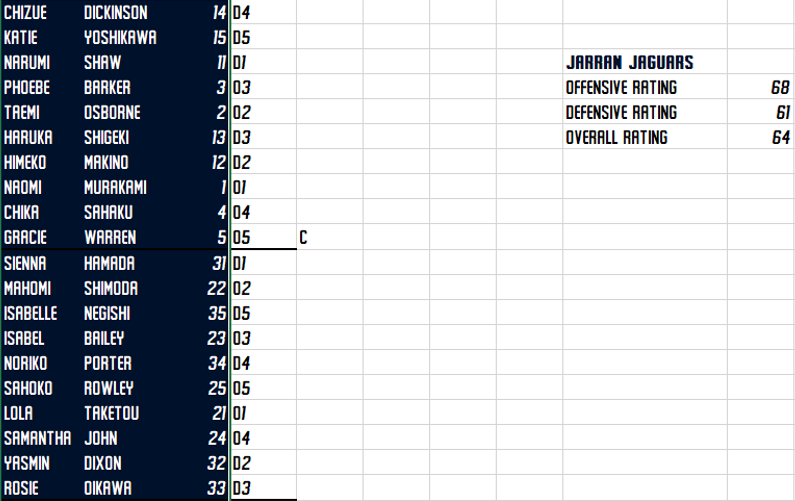 No one expected much out of the two expansion teams in their first season, and the Jarran Jaguars have certainly met those low expectations, finishing the first 10 games with a record of 3 - 7, in 7th place, only ahead of the Chibihasa Lightining in Point Differential (-14 to -40). Like Chibihasa, Jarran has been struggling away from home, losing all 5 of their road games. Jarran's three wins came in Week 2; where they beat the 2011 AHBA Champion Rondelle Lions on a game winner from 2nd overall pick O5 Gracie Warren, Week 6; where they beat the Turrif Raiders in a team effort, and in Week 8; getting their revenge on the Lightning, beating them by a point less than the Lightning beat them. 2nd Overall Pick, Gracie Warren has shown that she not only belongs in the league, but that she will be a great leader and future All Star, after being thrust straight into the Jaguars' captaincy. The Jarran crowd seem to be loving the team despite their lack of success, which bodes well for the future of the team. In sixth place, with a record of 5 - 5 (2 - 3 home, 3 - 2 away) the Honnaro Flight have had a much better start to their first season compared to that of their expansion cousins, the Jarran Jaguars. 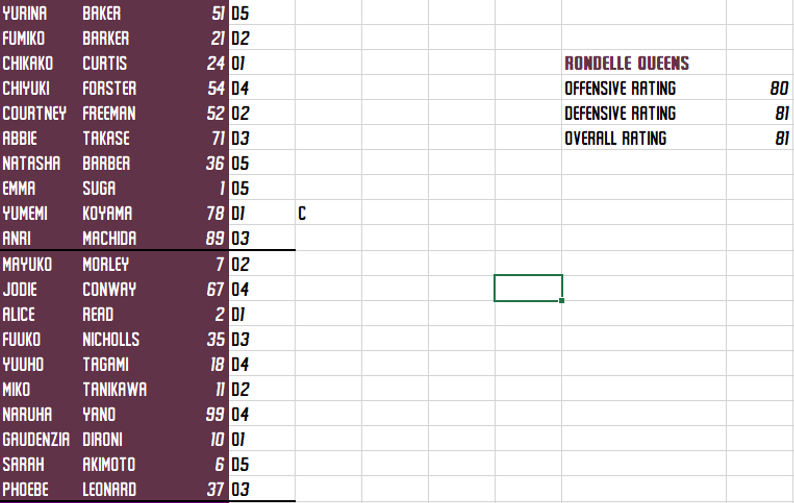 The team looks to be stronger overall compared to the Jaguars, especially in the starting lineup, which is well indicated by Honnaro's extra wins. Honnaro's wins came in; Week 3, against the Jaguars, beating them thanks to Honnaro's superior defence by 8, Week 4, beating the two-time Conference Champion Hikaru Heat by 7 in a gritty effort, Week 7, where they beat the Raiders by 3 in a close game, Week 9, taking down the Magic in a game that seemed close on the scoreboard, but not so much on the court and Week 10, where they beat the Jaguars again (making them 2 - 0 against their expansion cousins), this time by only 3. The Flight are on a two game win streak currently, which they hope to continue. 1st Overall Pick, Brooke Douglas, has also been thrust into captaincy early on and has shown that she too is a great leader. Her production however is slightly lower than her fellow rookie Gracie Warren, so look for Brooke to prove herself further throughout the season. 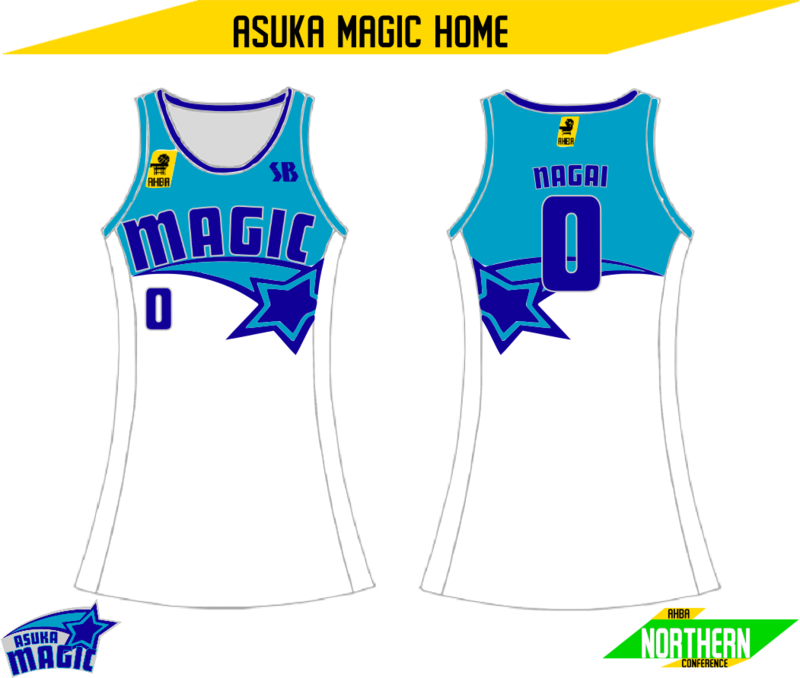 In fifth, with an identical record to the Flight, 5 - 5 (2 - 3 home, 3 - 2 away), is the Asuka Magic. 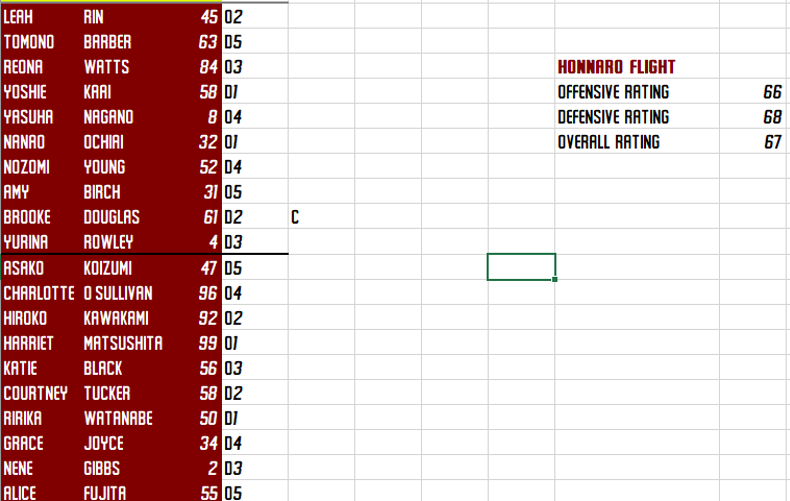 The only difference between fifth and sixth is PD, with the Magic boasting a PD of -30 compared to Honnaro's -69. 2012 has been much kinder so far to the Magic, who look to finally be on track. Captain Nana Tomita is very happy with her team's play as of late, saying in a post-game interview: "The locker room feels the best it ever has, there's just so much positivity around. I think we are all excited at the prospect of making the playoffs despite how early in the year we are." The Magic's five wins came in; Week 2, where O2 Sienna Connolly hit an almost half court shot to win the game, devastating the Flight, Week 3, the Magic won in overtime on a huge defensive stop by their captain, Week 5 bought a fairly easy win by 9 points against the Jaguars in Jarran, Week 7 saw the Magic led by 5th Overall Pick, Melissa Hart (who has lead the bench for the Magic) and the bench in a 12 point win against the Lightning and Week 8, where a whole team effort saw the Magic embarrass the Defending Champion Lions by 20. 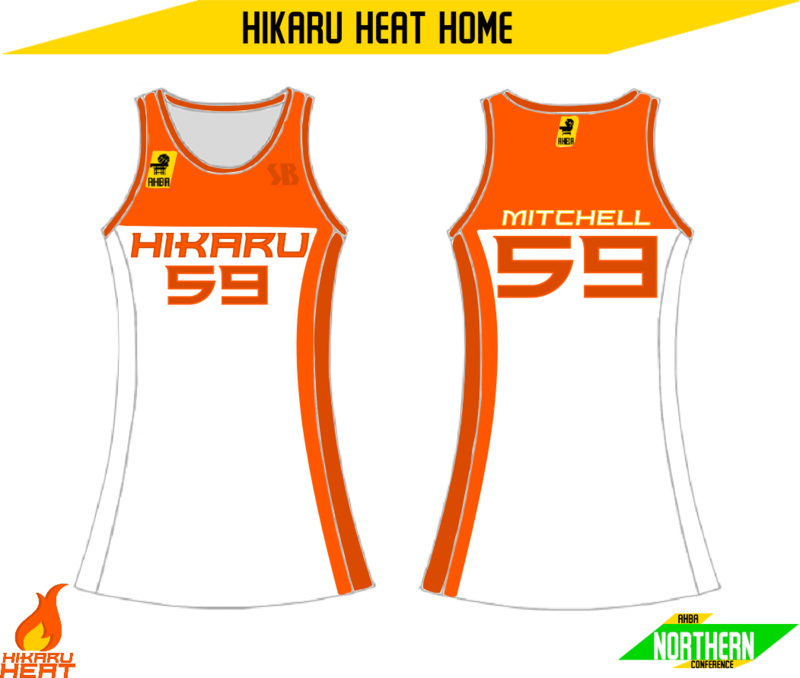 The two-time Northern Conference Champions, the Hikaru Heat, find themselves also at 5 - 5, but with a much better home record (4 - 1 home, 1 - 4 away) than the two teams before them. The Heat also boast a positive PD of +44, which is the second highest overall. The main concern for the Heat is the losses away from home, but every team above them is in a similar situation, and the Heat have proved before that they can win games on the road. 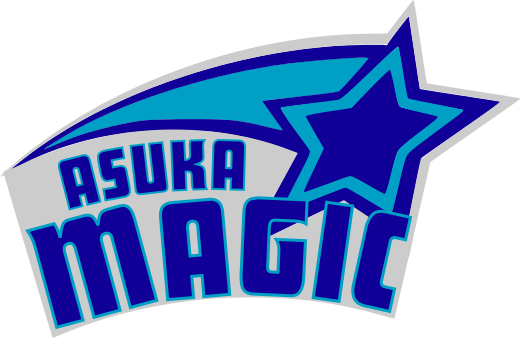 Their lone road win came against their rivals, the Asuka Magic in Week 6, by a large margin. 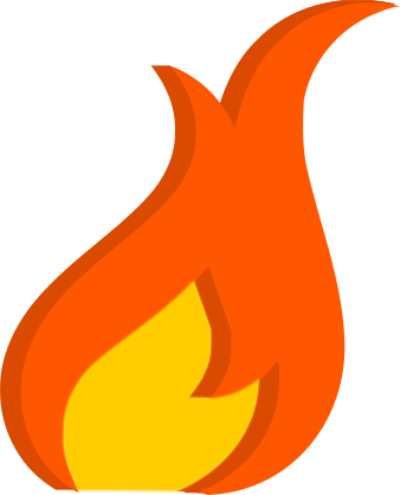 The rest of the wins came at home for the Heat, winning in; Week 2, where they pulled out a six point win over the Lighting, Week 5, which saw the Heat win by 15 against the Queens, Week 7, saw the Heat pull out another 15+ point (23 point) win this time against newcomers Jarran and Week 10, in which the Heat once again won by 15+points (19 points), this time taking the first game of the season series against their matchup in the finals last year, the Rondelle Lions. On the rookie side of things for the Heat, the 7th Overall Pick, Hisa Howarth, has been putting up solid rebounding numbers for their bench, making the Heat's bench one of the most potent defensively. Last season's RotY, Gracie Bird has also shown once again that she is more than capable of filling the O2 spot, scoring 15 points in 5 straight games. 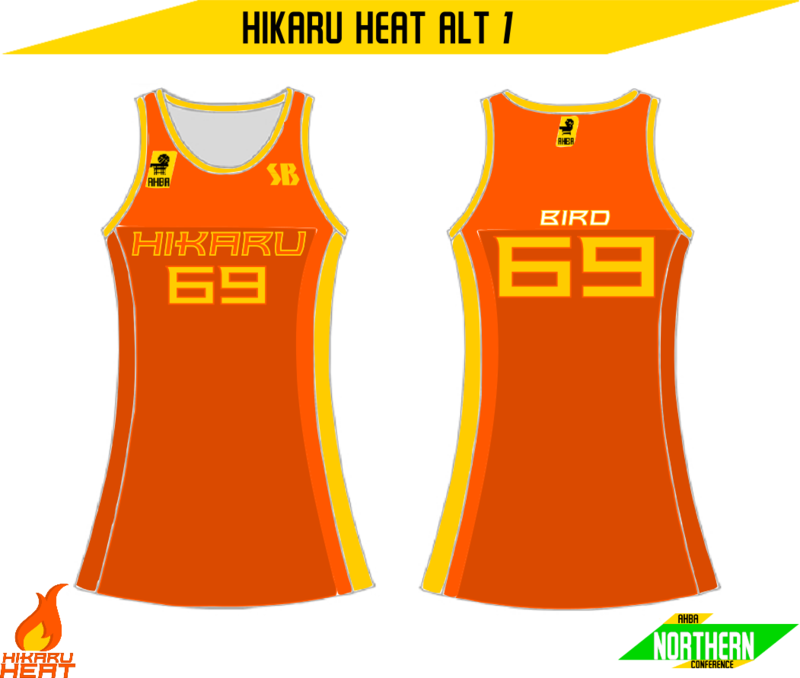 The 2011 AHBA Champions, the Rondelle Lions, find themselves a win ahead of their matchup in last year's finals, the Hikaru Heat. Sitting at 6 - 4, with an even better home record (4 - 0 home, 2 - 4 away) than the Heat, it seems that the Lions are still on top in this matchup, despite losing to the Heat by 19 in Week 10. The Lions have started very similarly to how they played during last season, winning plenty of games at home. The Lions won at home in; Week 1, where they beat the Magic by a considerable margin, with Megan Murata getting 4 steals in just 14 minutes of play, Week 3, winning a game that turned out much closer on the scoreboard than how it looked on court against the Heat, Week 7 saw the Lions take the first game in the Rondelle Derby by 9 points, behind a double double (17 points, 12 rebounds) from O5 Harriet Higarashi and Week 9, pulling out a close win against the Jarran Jaguars. The Lions also won on the road in Week 4, winning by four against a lost looking Lightning squad and in Week 6 against newcomers the Honnaro Flight by 6 points. Rookie wise, 8th Overall Pick, Sophie Yoshizawa is starting for the Lions, averaging around 7 rebounds and 1 block a game. Also sitting at 6 - 4 (5 - 0 home, 1 - 4 away) is the Lions hometown rivals, the Rondelle Queens. The Queens have started out strong this year, bolstered by the return of O5 Natasha Barber from her injury late last season. The combination of Barber and fellow O5 Emma Suga has provided for the Queens time and time again during the early part of the season, especially in the Queens' Week 1 destruction of the Flight, where Suga threw down a huge dunk on rookie Brooke Douglas off a pass from Barber. Team MVP D1 Yumemi Koyama has once again quietly shown her skills defensively racking up 5 steals in that same game. The Queens, much like the two teams below them (and the team above them) in the standings, have not won many games on the road, suggesting that road wins may end up being the only thing that separates the top 4. Aside from Week 1, wins came in; Week 2, where Koyama took over the game defensively, allowing her matchup a single point in the last quarter to pull out a 12 point win over the Raiders, Week 4, where Barber and Suga combined for 30 points and 21 rebounds to beat the Jaguars by 10, Week 6, hanging on in the last quarter by 4 against the Lightning, with a large amount of their starting defensive players on the bench after getting into foul trouble early, Week 8, where they recorded their lone road victory with a 6 point win over the newly formed Flight, and Week 10, a slow game which the O5 duo dominated from start to finish. One main concern for the Queens this season will be making sure Suga stays, which judging by the team's success of late, should not be too much of an issue. Rookie wise for the Queens, 6th overall pick, Mayuko Morley has shown to be a solid shooter, especially when playing next to Gaudenzia Dironi, who has been passing the ball extremely well off the bench. Morley currently sits 4th in 3 point shooting percentage, shooting 40% from 3. "We sat down with Showpony herself, and asked her a few questions on adjusting to life in Rondelle, the ABHA and why she came over, her number choice and that nickname. AsacaHoops: First of all, thanks for coming and talking to us. AH: How has Rondelle been treating you so far? Has there been anything that has been hard to get used to? AH: It really does seem that you get along with everyone out on the court, but is there anyone in particular you get along with well? GD: Yuemi (Koyama, Queens captain) has been really helpful in getting everyone to make me feel welcome, but Bread (her nickname for Yurina Baker) has got to be my favourite teammate. We go almost everywhere together, and she's shown me some pretty cool places. AH: You guys have been playing well lately and so have you for your first season over here. Is there any difference in the AHBA to how you played back home in Itesca? GD: We have been playing great lately, which is good, and I'm just doing what I can to help. There is heaps more threes in the AHBA, which I'm not used to. We only took them as a last resort in Itesca. AH: What made you come over here to play in the AHBA? Why did you choose the Queens? GD: The fans love me! *laughs* But the idea of playing against the best in the world was the real reason. I chose the Queens because of the players on the team. I thought that I could be a real help to the team. GD: I couldn't have number 1 because Emma (Suga) has it, so I added the 0 on the end. AH: Last one, how do you feel about being called Showpony? GD: I love it! *laughs* I like to celebrate and have fun, so I like it. AH: Thanks for your time. GD: No problems!" AsacaHoops, Issue 24, March 2012. I sometimes question why I keep this thing going, but I don't want to give up either... That's why I now present to you, results for Weeks 11 - 20. Eighth placed Jarran (4 - 16, 1 - 9 in the last 10 weeks) has continued its early performance, dropping from seventh in the last ten weeks. Their lone win came against the struggling Magic in Week 19. It's obvious that they got the short end of the stick in this year's expansion draft, and they should be looking to tank the rest of the season to bring home the top pick in next year's draft. 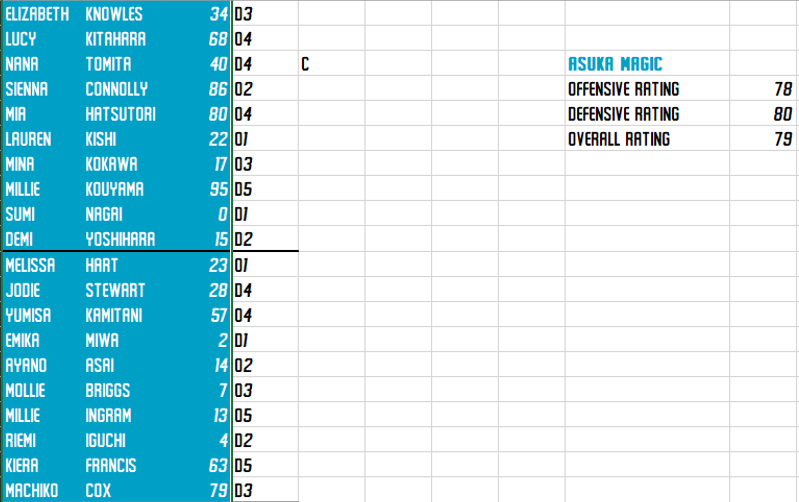 Their performance this season reminds many of Chibihasa's horrible first season, so many in Jarran hope that the Jaguars can rebuild through the draft. Rookie Gracie Warren has continued to excel both on the court and in her role as the Jaguars' captain, bumping up her season stats to 15 points and 12 rebounds per game over the last 10. Despite their continued losing (largely due to their lacklustre defence), Syncamore Insurance Arena's attendance numbers continue to grow, with the arena close to it's capacity in Week 17 when the Jaguars took a 30 point loss to their expansion cousins Honnaro. This bodes well for the Jaguar's inevitable success in the future. Dropping from fifth ten weeks ago to seventh, the Asuka Magic (7 - 13, 2 - 8 in the last 10 weeks) have struggled to pull out wins, losing a close game against their rivals the Heat after forcing overtime. Their two wins came in Week 12 against Jarran and Week 14 against Chibihasa. 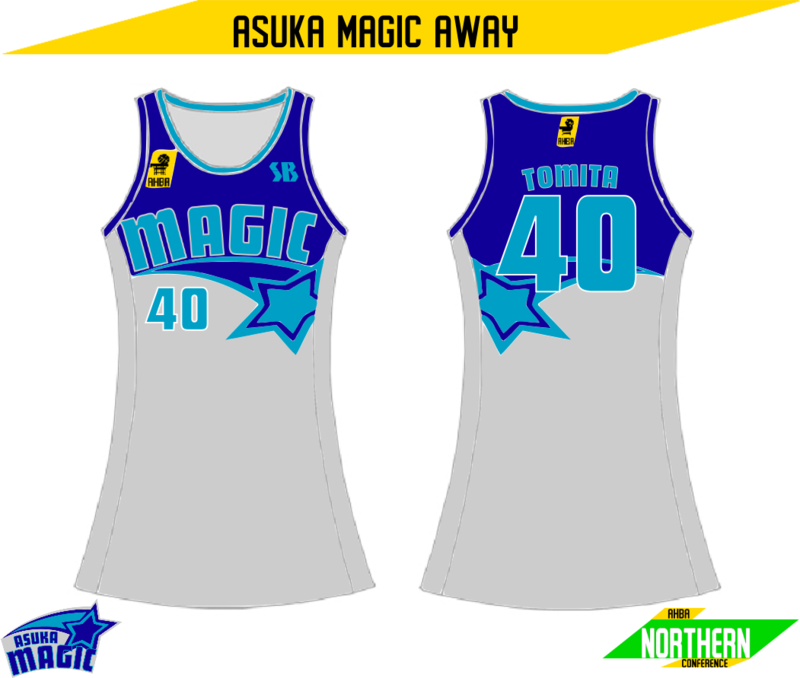 Neither of the two wins were particularly dominant, and the rest of the Magic's last ten weeks have indicated that they need help defensively, despite captain Nana Tomita's best efforts, averaging 13 rebounds and 2 blocks per game. Rookie O1 Melissa Heart has seen quite a large amount of minutes lately due to starting O1 Lauren Kishi picking up a wrist injury in practice. Kishi is expected to return to the starting lineup within two weeks. It seems that if the Magic cannot get their act together, they too will likely be looking to tank for the first pick for the last 11 weeks. 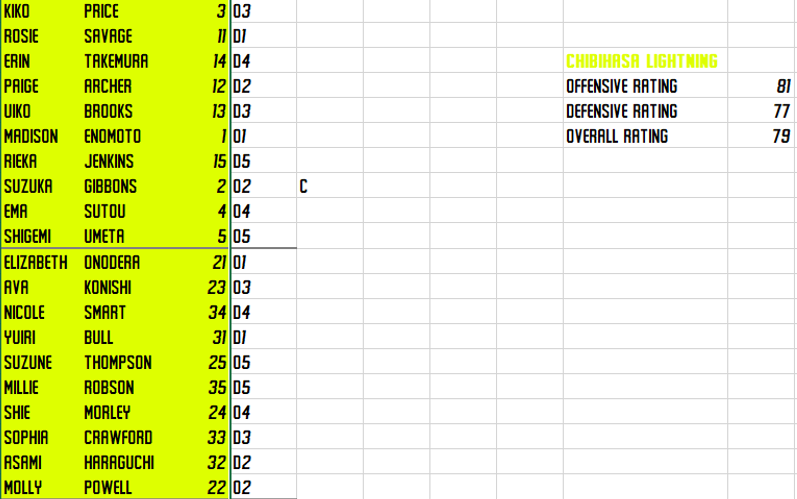 In sixth is the Chibihasa Lighting (7 - 13, 4 - 6 in the last 10 weeks) who have had a much better second 10 weeks. Their record of 4 - 6 in the last 10 games is a sign that the Lighting are starting to get it back into gear. Suzuka Gibbons has had a slightly more quiet 10 weeks, averaging 18 points and 4 assists in that period. 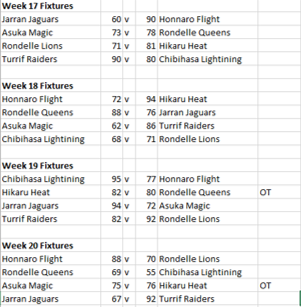 Chibihasa's four wins came in Week 12 against the Flight, Week 13 against the Queens, Week 15 against the Jaguars and Week 19 where they once again beat the Flight. The Lightning also continue to struggle away from home (1 - 9 away), which is a large reason why their PD is just under -100. Rookie O1 Elizabeth Onodera has been a solid option off the bench for the Lighting, but doesn't look to be competing for Rookie of the Year with her stats of 6 points and 7 assists in just over 14 minutes of play. The Lightning will now look to improve their record further in the next 11 weeks to grab the second Northern Conference Finals spot from the Flight. 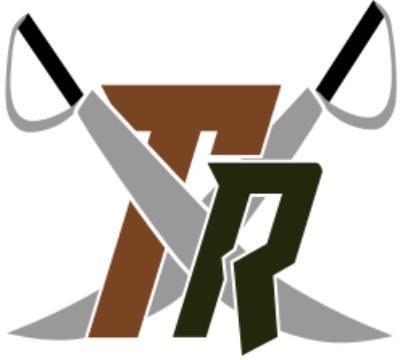 Sitting in fourth, down from first 10 weeks ago is the Turrif Raiders (12 - 8, 5 - 5 in the last 10 weeks). Many people were surprised to see the Raiders sitting on top after the first 10 weeks, considering how bad their season was last year. Now that we are past the half way point of the season, the Raiders seem to be in a more realistic finishing position. The Raiders last ten has been a mixed bag, winning and losing exactly 5 games. The wins came in Week 11, against the Magic, which extended their win streak to 4 games, Week 13, against the Jaguars, Week 17, against the Lightning, Week 18, again against the Magic and Week 20, again against the Jaguars. Rookie Sarah Miles has been a solid starter, further frustrating ex-starter Jodie Thornton to the point where the two were involved in an altercation after practice in Week 20 leading to Thornton being suspended for 4 weeks. The Raiders have been allowed to sign another player for the duration of Thornton's suspension. Subsequently, they have brought back Leah Fujikawa, who was with the team for both 2010 and 2011. 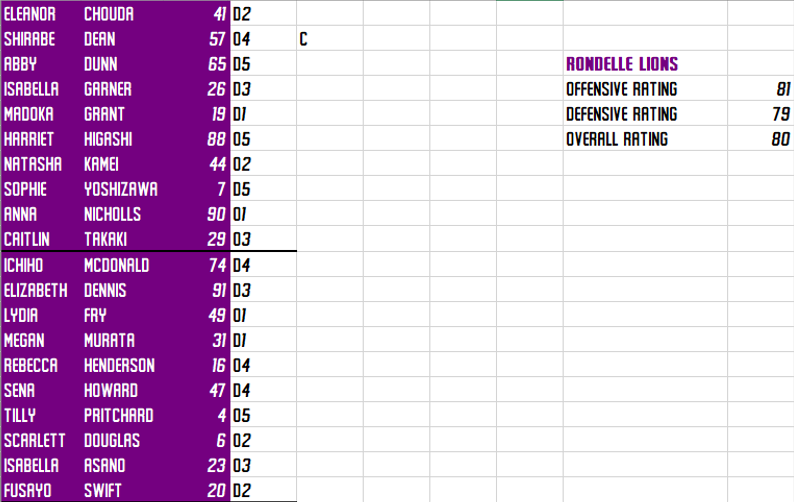 Third place is one of the two Rondelle teams, the Lions (13 - 7, 7 - 3 in the last 10 weeks). The defending champions seem to be playing quite well, sitting currently in the second Southern Conference Finals spot. They haven't improved position wise over 10 weeks ago, but this is hardly an issue, as long as they make it to the conference finals. Their wins came in Week 11, against the Lightning, Week 12 against the Raiders, Week 13, against the Flight to make it 3 wins straight, Week 15, against the Magic, Week 16, against the Jaguars, Week 18, again against the Lightning and Week 19, against the Raiders. Sophie Yoshizawa, the eighth overall pick this year has been a solid addition to the Lions starting defenders. Expect for the Lions to try take home court advantage (though it matters little, as they are behind the Queens) in the next 11 weeks as they try to defend their title. Second place, only by PD, and first in the Southern Conference, is the Queens (14 - 6, 8 - 2 in the last 10 weeks). The Queens have been impressive so far this year, sticking in second through both Week 10 and 20. They would be in first, if they had won by a total of six points more throughout the 10 weeks. This happened mainly due the amount of close games that they won. The dual O5 lineup of Suga and Barber has really come into its own when faced with these tight wins, largely thanks to the pairs' rebounding and scoring abilities. Team captain Yumemi Koyama has been thrilled with her play (and her team's) as of late, holding Suzuka Gibbons to just 10 points in their Week 20 victory over the Lightning. Their 7 other victories came in Week 11, against the Jaguars, Week 12, against the Heat, Week 14, in a close Rondelle derby, Week 15, in yet another close game, where the Flight pushed them all night, Week 16, against the Raiders, Week 17, against the Magic and Week 18, where they extended their winning streak to 5 games, before losing in OT to the Heat in Week 19. Another interesting note is that the Queens are still undefeated at home (11 - 0), which bodes well come Conference Finals time. 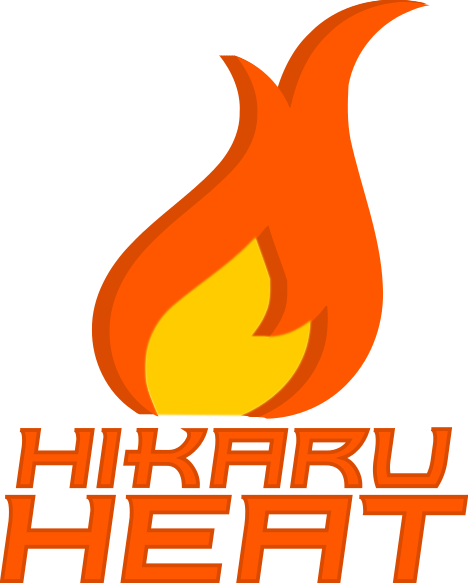 In first, also with a record of 14 - 6 (9 - 1 in the last 10 Weeks) is the Hikaru Heat. Being first is proving to be a huge boost for the girls, with Abby Mitchell saying in Week 20 that she's "already ready for our 3rd finals straight, this time I think we can bring it home." The Hikaran crowd seem to love it too, with Pintronics Arena packed game after game. 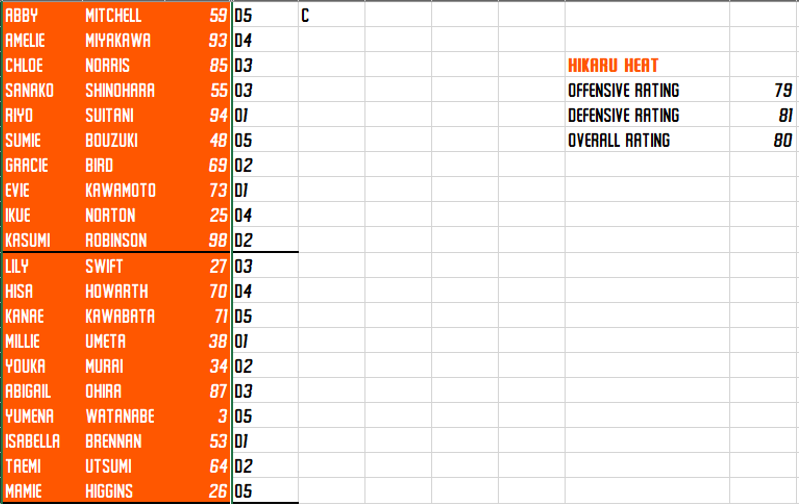 Hisa Howarth, who was the Heat's pick in this year's draft has been a real presence off the bench for the Heat, and last year's RotY Gracie Bird has been a consistent scorer alongside Sanako Shinohara. Their 7 wins came in, Week 11, in a close game against their neighbours, the Flight, Week 13 against their rival, the Magic, Week 14, against the Jaguars, Week 15, against the Raiders, Week 16, against the Lighting, Week 17, against the Lions, to make it five wins in a row, Week 18, against the Flight again, Week 19, against the other Rondelle team in overtime and Week 20, where they beat the Magic by 1 in OT, to end the ten weeks on a 9 game win streak. If they can keep this up they will be back for their third straight AHBA Finals. Outline: The ASHBA functions as a feeder competition, much like the NCAA competitions do to the major American sports. All of the players in the ASHBA are student-athletes, meaning most games are played on weekends in the morning. Some players never continue on to play in the AHBA, instead furthering their education or finding employment. Many however do enter the AHBA, and along with various international born players, form the draft classes for each year in the AHBA. Rules wise, the ASHBA plays largely the same as the AHBA, apart from a slightly shorter three point line and longer breaks in between quarters (10 minutes). The ASHBA currently features 8 competing schools, four from Ocella and four from Inada. The ASHBA won't become a major part of the AHBA universe, more used for background for the new rookies each year. There will occasionally be results of major ASHBA games. The Schools: The eight schools that make up the ASHBA have all been known for their HoopBall programs, even before the existence of the AHBA & ASHBA. Since the introduction of the two leagues, many more schools have started HoopBall programs, which as of 2012 are in the process of being integrated into the ASHBA. Roeburgh Hub School, Osyth Girls School, Seiichi Hoshino High and Port City High/University make up the four Ocellan schools. Asuka High School, Hikaru High School, Chibihasa High School and Golden Sands High/University make up the four Inadian schools. To start the concepts off are two Ocellan schools, Roeburgh Hub School and Osyth Girls School. Roeburgh Hub School is the largest school in all of Asaca. Most children from the greater Rondelle area and to an extent Turrif and Jarran are schooled here at some point in their childhood/teenage years. Being a Hub School, every level of schooling in Asaca (Primary, Secondary and High) aside from university are taught on the one campus. The school's colours of Dark Purple and Cream play on the royal heritage of the school, the name of which comes from the Asacan Royal Family, who founded the school in the late 1800's. The school itself is older than a fair amount of Asaca, and most of the original buildings and classrooms are still in use today. On the HoopBall side of things, Roeburgh Hub is the most successful school both in the ASHBA (winning in 2010 & 2011) and prior to the formation of the ASHBA, with a all time record of 134 - 94. 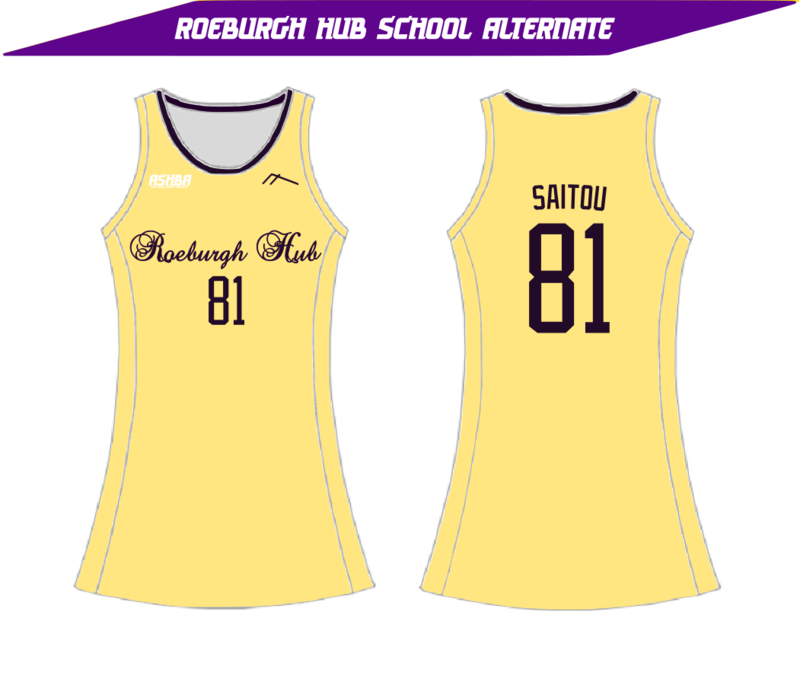 ALPE is the manufacturer of Roeburgh Hub's uniforms, and has been since 2010. On first thought, Osyth seems to be a very strange place to have a girls only school, with the focus of the area placed on metals and power for the whole of Asaca. The dark, ominous streets and lingering sense that you could be killed at any time make Osyth a difficult and scary place to live. The presence of the school and the neighbouring Osyth Boys School presents a safe haven for a large amount of students that study and live in Osyth. Opened in 2000, Osyth Girls (and the neighbouring Boys School) is relatively new compared to other schools in Asaca. Osyth Girls holds the distinction of having the lowest number of reported cases of bullying in Asaca, mainly due to the nature of living in Osyth. The school's colours of White and Black are a huge contrast to that of Osyth in general, and make students stand out. The school's uniforms are seen everywhere after school, with many students leaving their uniforms on for the extra safety it brings them. 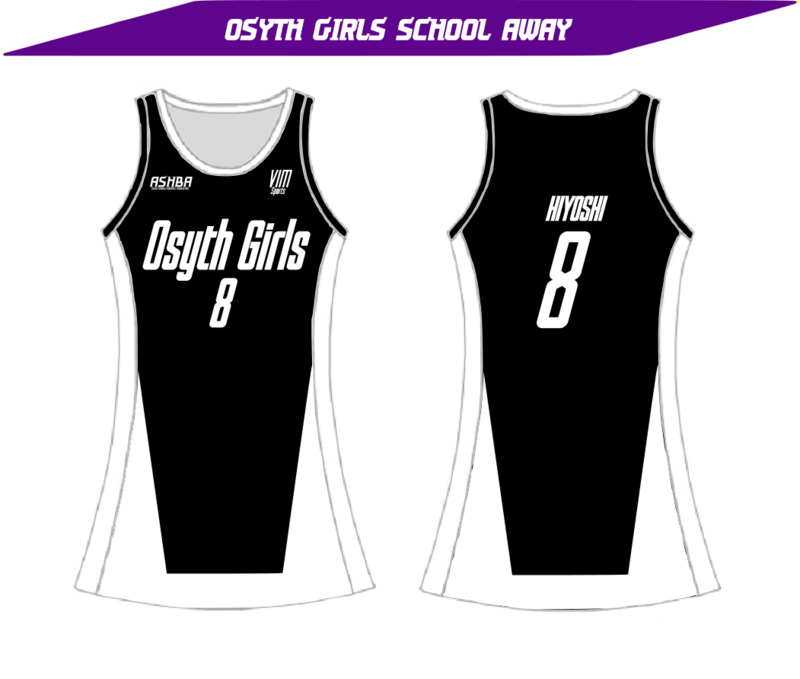 On the HoopBall side of things, the Osyth Girls team is known for its gritty play and tough nature. This led them to second and fourth place in 2010 and 2011 respectively. VIM Sports currently manufactures the team's uniforms and has been since 2011. That's all for now, but expect more soon. I've really enjoyed making these, largely due to how simple they are. I also hope you like the backgrounds of the schools, cause I really think it adds to the HoopBall universe and gives a more in depth look at some of the Asacan cities. And here I am back with some more ASHBA Concepts! This time I have two more schools for you all to enjoy. Hikaru High School is one of two schools in Asaca built in the 1980's, the other of which is Asuka High School, in nearby Asuka. The school, like the city it is in, is always refurbishing or upgrading something, making school life somewhat difficult for many of the students who attend the school. At the beginning of this year, the school's gym was resurfaced and refurbished, pushing back the HoopBall team's start of training to a week before the ASHBA season began. 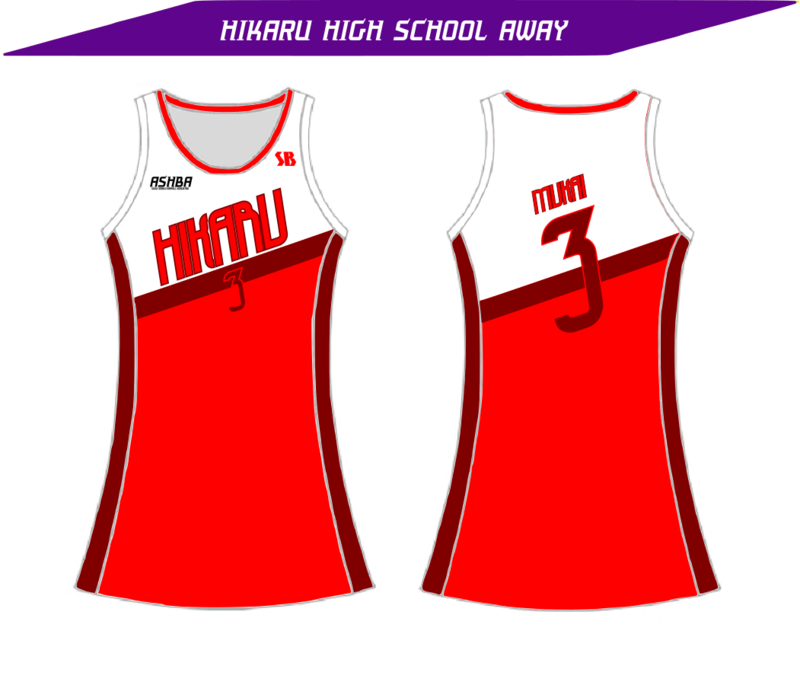 Despite this, Hikaru High look to be continuing their solid play, cementing their spot as second best team in the ASHBA. 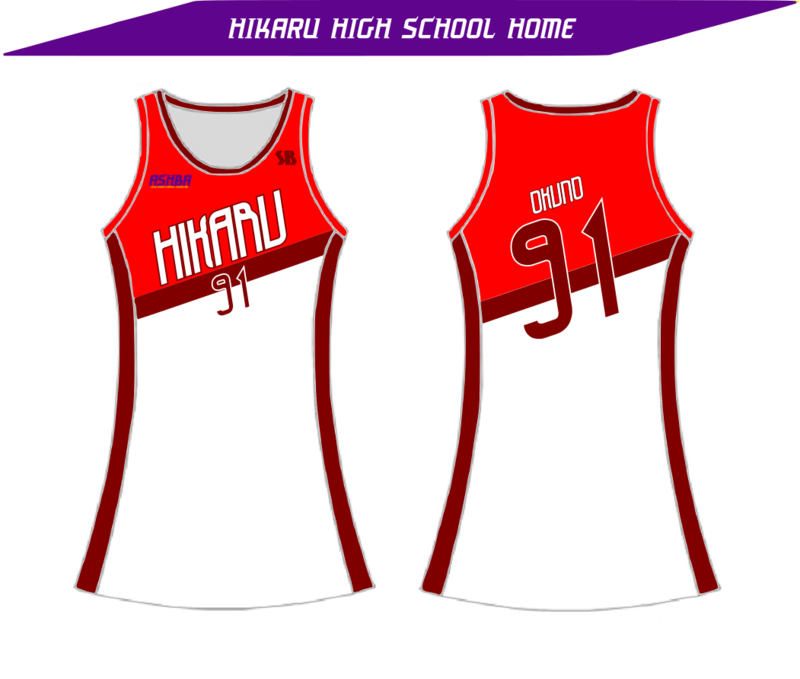 This success comes largely from their ability to choose from so many student-athletes, due to the school servicing both Hikaru and Honnaro whilst a school is being built in Honnaro. The school is also famous for the fact that Mishi Tori, a much loved Asacan cosplayer, attends the school. The school's uniforms are supplied by SB and are a new design for 2012. Asuka High School is the second of two schools built in the 1980's in Asaca. Unlike its counterpart in Hikaru, Asuka High rarely sees upgrades and refurbishments. This is largely due to the middle class nature of Asuka, and the fact the average age of residents in Asuka is 46. Asuka High is a school often overlooked thanks to it's rather quiet presence in the ASHBA and in Asaca in general, but many great HoopBall players, such as last year's MVP Suzuka Gibbons have graduated from Asuka High. The quiet nature of the school also means there is little interruption to the students and their learning, with Asuka High students being amongst the best academically thanks to this. 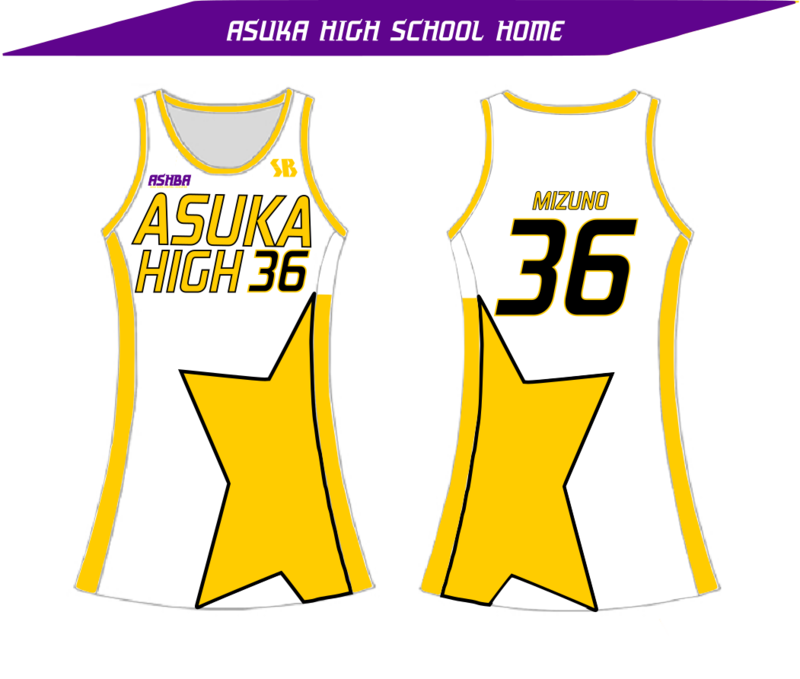 The Stars, Asuka High's HoopBall team have a following amongst the students of the school, but are overshadowed by the Magic, despite the Stars solid, but uninspiring play throughout the years. 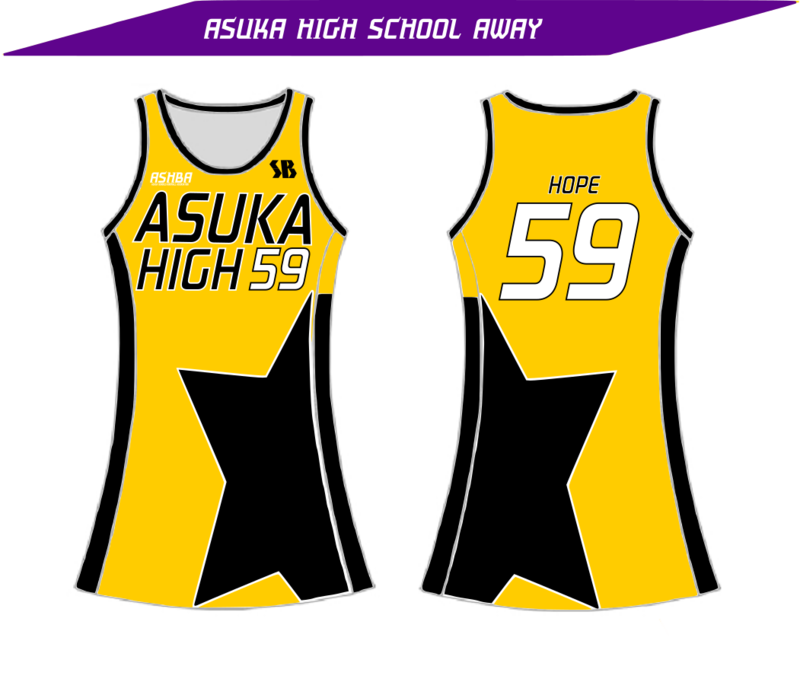 SB have been supplying Asuka High's uniforms since the founding of the school, and the design currently in use has been in place since 2006 with some minor tweaks. That's all for tonight, but expect more tomorrow, as I have now created all eight schools' uniforms and hope to start being more consistent with putting things up HoopBall wise. Here's two more ASHBA concepts, as we continue to push our way through the eight teams in the ASHBA. Built in 1966, Chibihasa High is the second oldest school in Asaca, but after renovations in 2009, you'd hardly be able to tell that the main building of the school is 46 years old. The gym however is still very similar to how it was built in 1966, with a few modern necessities added in. 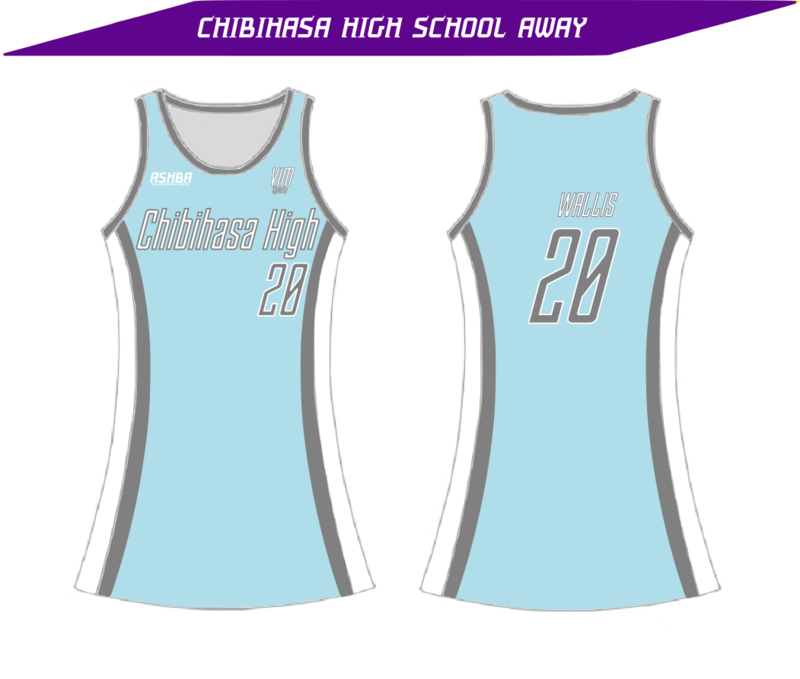 This creates a weird kind of paradox for people who come to the school's HoopBall games, seeing a sign that reads "Chibihasa High HoopBall Team, founded 2000". This is largely because the city took a long time to catch on to the idea of HoopBall, causing many students who lived in Chibihasa to make the half hour train ride to Asuka High just to play HoopBall. Since 2000 however, Chibihasa High has put out a solid team most years, with a few up and downs here and there, most notably last year. 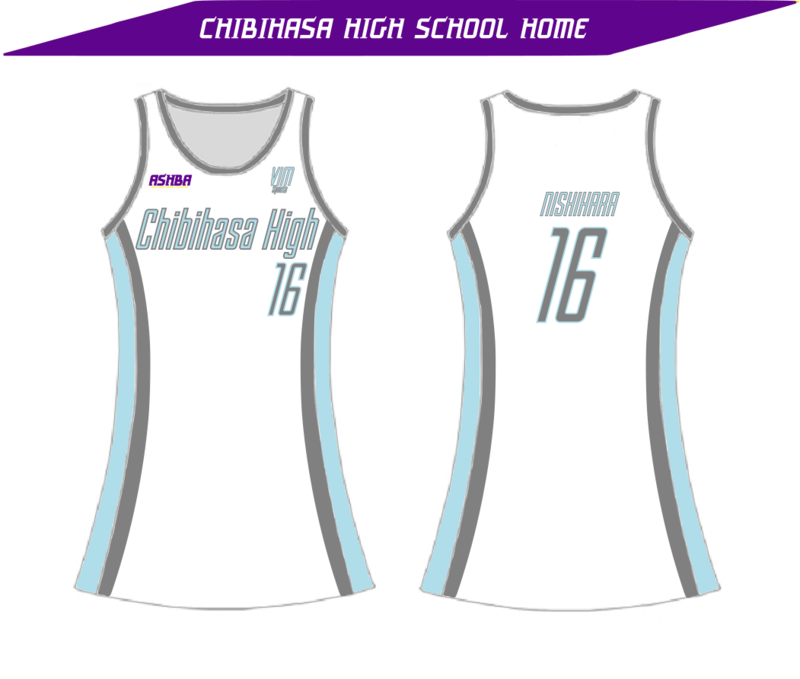 VIM Sports took over Chibihasa High's uniforms this year, after Chibihasa looked to get away from their previously cluttered look. Based in Kinori Bay, Golden Sands High/University is one of two schools set up with a High School and University on the same campus. The mix of high school students wearing uniforms and university students wearing casual clothing is an interesting look, especially when certain Year 12 students do university courses. This mix also poses a problem when the high school has a casual day, making lunch-times difficult for teachers. Despite the quirks, the school is run very well and the ability for Year 12 students to do university courses gives Golden Sands a large advantage academically. However this comes at a price, one that is quite reflective of Kinori Bay's calling as a mid to high class holiday destination. Golden Sands' uniforms are supplied by SB for both the High School and University's teams, which share both a gym and uniform designs. Do the schools have crests, or is it logos like in the USA and will we get to see any of those? I think Golden Sands needs a dark color to balance out the light colors you have going on, they're a little hard to read as they stand now. Maybe a dark blue? Or just darken the blue you already have? Otherwise these are pretty good. Keep up the good work! Seeing the darker blue, it's the white text on gold and sand background that's the actual issue I think. It would be a little hard to read in motion. - Go with a solid stripe instead of the gold and sand and use the other color for an outline to make the text stand out more. - use white as an accent/outline color only. - ignore this entirely and leave it as it is. Personally, i like the look of the darker blue with the lighter sand and gold better, but that may just be a University of Michigan bias and general dislike of sky shades of blue. Here's a third version with outlines on the numbers (unfortunately due to the font used for the wordmark being thin, I can't do anything but have the same colour outline for that),with two different options colour-wise for the away... I personally really like all the light colours together, and hence I am struggling to implement the dark blue properly. I do agree though the white on sand/sun doesn't work. I also can't bring myself to go for a solid stripe, mainly because it removes so much character. I also see what you mean with Michigan, the colours with the dark blue do look very similar.